I’m just back from three weeks of travel in Italy with my family. It was hot, it was touristy, it was expensive. We had a great time. The best and most memorable times are the ones you don’t plan for.The astonishing restaurant you stumble into randomly, because the one you were heading for was closed. The town square in the town you decided to stay in just the night before, because you were too tired to finish the drive. Too rigid a plan can bleach all color and life from a trip. The same goes for a piece of writing. 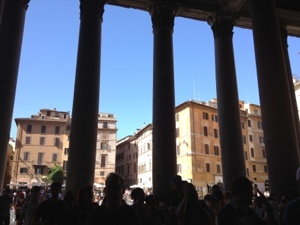 Places you remember are never quite the same when you return.Ah, Rome! The colors, the art, the food! (The noise, the crowds, the lousy tourist restaurants, the aching-feet-where-the-heck-are-we-anyway?) Places change, of course, but so do we—our interests, experiences, frame of reference and even values. My husband and I both suspect the food in Italy was just a tad less astounding this time around because food in the U.S. has become so much more sophisticated since we were there last, 20 years ago for me and 30 for him. Remember that your audience’s frame of reference changes, too. The same person who isn’t receptive to your message now may be receptive next week or next month. If you have something important to communicate, return to it often. What seem like universal rules at home are often just a matter of local style and custom.Ok, what I’m alluding to here is trivial in the extreme. I want to make clear that I do know that as a middle class American my life is vastly different, and in many cases far more luxurious, than the lives of millions of people around the world. But I’m talking now about the tiny details of everyday life we take for granted. For example, weeks into my travels in Italy, I’d still pull out my money to pay as I was ordering my morning coffee. But in Italy, you don’t pay when they hand you the drink. You pay when you’re finished drinking it. There’s something lovely about that. It’s handled so casually that we once walked out of a “bar” and across the square before realizing we hadn’t paid. When I ran back, no one seemed to have noticed. I imagine Italian tourists are startled to be asked for money before they’re even given their drink. It must seem rude in the extreme. On the other hand, they can carry their drinks to a table and sit for no extra charge—not so in their own country. A minor detail? Of course. But it’s also a reminder to step out of our world-view sometimes, or at least to understand that our understanding of the world is inevitably colored by that view. And that has consequences for how and what we communicate. Never be afraid to try something new. Well, does this one need any explanation? I’m glad I momentarily forgot that “baccala” means re-hydrated salt cod, although admittedly I probably won’t order it again in a hurry. You can only work with what you’ve got (or: go with the flow).We went to Italy in August. Hands-down, the worst time of year to go, but it was the only possible time for our family. So we worked around the heat, the “chiuso per ferie” signs (“closed for vacation”), the density of tourists. We got up early when it was still cool and the streets were relatively empty. We went back to the (air-conditioned!) apartments we’d rented in the heat of the afternoon and went out again in the evenings. We found the great places that were open, and stopped worrying about the ones that weren’t. Every writing task has its restrictions. Every corporate culture has its rules. Fuggedaboutit! Work with the strictures, not against, for maximum creativity. People appreciate you trying to speak their language.I don’t speak Italian. But with the help of a phrase book, a dictionary, my beginner’s-level Spanish and a vague knowledge of Latin roots I was occasionally able to conduct a whole, 45-second transaction in the language. And although I’m sure I butchered my end of the interaction, it was usually clear that the person on the other end was appreciative of my efforts. As a professional communicator, you don’t want to condescend to your audience by using fake, overly-casual or hip language. But you do want to try to speak in a language they understand (avoiding jargon, acronyms and corporate-speak), rather than force them to look up your words in their (metaphorical) corporate phrasebook. There’s probably always a certain amount of waste—time and money–involved in trying something new. Mistakes are a given. Buying postcard stamps at the Vatican that you only later realize can’t be used outside of Rome? And then losing them until you reach Florence? In communications, as in everything else in life, don’t beat yourself up for your mistakes. Chalk it up as a learning experience and move on. You learn more when you admit you know less. Never be afraid to look like a tourist by studying a map, reading a guidebook or asking questions. Ditto for anything you’re writing. Especially if you’re acting the part of a journalist—reporting on a something new to you—it’s wise to go out of your way to ask the question that might at first seem “stupid.” You might be surprised by the answer. Travel works much better if you leave time for some things that have nothing to do with travel.I can’t be a tourist every minute of the day. It’s too exhausting. I enjoy everything more when I have time to put in a few hours with a good book or just take some time off for a nap. Similarly, no matter what your deadline, try to leave time for a break. A piece of writing is nearly always better if you take some time away from it—leave it over night or even longer if you can—and return to it with a fresh eye. After three weeks of Michelangelo, Titian, Giotto, Bernini, Caravaggio and Brunelleschi, a dollop of Jackson Pollack and even some Puccini—not to mention all those achingly beautiful but anonymous constructs from the ancient world, I’m back at work. Watch out, world!